It is becoming increasingly difficult to take Canadian politics seriously. The prime minister is in India, but essentially on a prolonged photo-opportunity (including self-taken photos), and a touristic visit with his family, with a very thin official schedule. 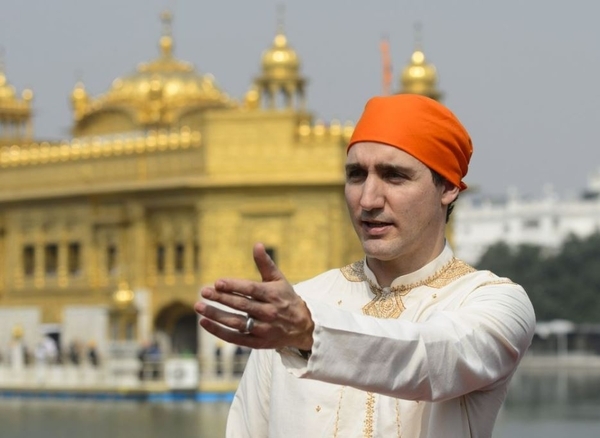 There is nothing wrong with that, and it is an immense and fascinating country, but he must be aware that news photographs of the Trudeaus in pious attitudes and adapted costume before eastern religious statuary and hobnobbing with controversial people was bound to incite a good deal of mirth and audible derision. His father did a bit of that, but managed to pass himself off plausibly as someone who knew a fair amount about the mysteries and folkways of East and South Asia, had travelled there extensively as a younger man, and was respectfully received by the highest authorities with whom he had substantive discussions when he went as prime minister. He adjusted his wardrobe somewhat, but was a renowned and discriminating clothes horse and sometimes dressed in eastern and sub-continental fashion at home. Whether it was a pose or not, Pierre Trudeau conveyed the impression of being on a serious mission of conciliating the world's great regions to the extent Canada could play such a role. The first Canadian leader to visit India was Louis S. St. Laurent in 1954, and he was most hospitably and respectfully received in extensive discussions by the long-serving Indian leader, Jawaharlal Nehru. They used to meet at Commonwealth leaders' sessions when it was a much less numerous and more important grouping than it is now, and co-operated to some degree in ending the Korean War, and later in the Suez affair (though as usual, the Americans did the heavy lifting, and most of the useful fighting). Pierre Trudeau knew a little of the drama of India and of the squalor of what Mahatma Gandhi called its "hundred thousand dung-heaps," (villages), even if he didn't frequent them. Justin Trudeau was greeted on arrival last week by the Indian minister of agriculture. There seems to be some mixing in sectarian politics, especially in respect of the Sikhs and Muslims. Justin Trudeau shouldn't get into that. He did eventually meet the prime minister, Narendra Modi, but it is unlikely that anything serious will result from their talks. The general tenor of press comment in Canada is that the country is tiring of exercises in the elegance of the Trudeaus; the country knows they are elegant and most Canadians are happy for that, as most were impressed by the worldliness of Pierre Trudeau. But two-thirds of the way through this mandate, a potentially dangerous number of Canadians think their government and its leader should be more preoccupied with public policy beyond institutionalized feminism and truckling to the so-called Indigenous nations. The British government is grappling with Brexit; the new French government with revitalizing the sclerotic French state; the Germans with assimilating a million refugees and gradually asserting Germany's natural strength in central Europe. The Poles and Hungarians and Austrians and Czechs are reconciling democracy with more authoritarian traditions, and much more successfully, especially in Hungary, than is commonly admitted in the Western media. Some of the leaders are more competent than others, but at least they all are busy trying to do something. Whatever anybody thinks of the current American president, he is working hard and trying to de-escalate the Korean crisis, assist Ukraine, has led the destruction of ISIL and is trying to salvage part of Syria, is enjoying an economic boom which he largely authored, is working on immigration reform and infrastructure renewal, and is diligently meeting with relatives of victims of school massacres to avoid the recurrence of such horrible tragedies. The prime minister of Australia is about to take half his government to the United States for intensive discussions of a wide range of issues, and it won't be a costuming occasion. Canadians are grateful, when they think about it, that we have fewer problems than most other large countries, and Canadians are more lighthearted than the world generally credits, but we (Canadian citizens and residents) aren't frivolous. The present government is hovering on the edge of that sinkhole in the perceptions of the people of Canada and of the world. Everything about the abrupt exit of Patrick Brown is fishy, including his apparent acquiescence in it. And as he tries to resurrect his career and run to succeed himself, he is facing a barrage of improvised piety from his acting successor and a defeated former rival (Mr. Vic Fedeli), and a hail of integrity questions about his acquisition of a home with a large mortgage on it. The vague insinuation is abroad that he might have received a loan for the down payment from someone who then became a nominated Progressive Conservative candidate by suborned favouritism. The integrity commissioner (a title that could have been devised by George Orwell), in the circumstances, will have to deal with this very quickly. Unless there is a serious problem and not just the conjuration of lateral suspicion-innuendo piled on hearsay and topped up by malicious hypotheses, another uncorroborated taint-and-flee operation, Brown should be welcomed to the race and as a candidate for re-election as an MPP. Given the questionable nature of his removal as leader, it is the best way to heal the party's divisions and score a public relations coup for the official opposition just about 10 weeks before the election writ comes down. Preventing him from standing for election on the basis of the pastiche of tepid suppositions that has come to (first) light so far would be a monstrous injustice, compounding the unworthy schemings and writhings that have already occurred. It all causes me to redouble my support of Caroline Mulroney as leader of the opposition and then as premier. She is all one would ask: intelligent, bilingual, glamorous, accomplished, impeccable in all things, a break from the dismal past, and someone who could sweep the province. She would head a fine team. Please let this great province not have more of the same — an inexorable march to the repossession of the residences of the people by bankrupt hydro utilities. I would also like to add a word of appreciation for Tanya Granic Allen. I would not recommend her as party leader. But in these times the presence of an articulate, fearless, and sane upholder of the sanctity of life from the hair-trigger abortionists, euthanasia-enthusiasts, suicide-routinists, and those nostalgic for capital punishment, and an abstainer from the view that any mention of theism is counter-inclusive and sullies the rites of state with the superstition of church, is welcome. Indeed almost, if I may, a Godsend. If they play it right, the Ontario Conservatives can have a brilliant election. The Conservatives need Caroline; Ontario needs the Conservatives; Canada needs a well-governed Ontario, and though it isn't widely recognized, the world needs a Canada it can take seriously. We can do it.